When I was young and living in the Colorado Rockies, in the tiny little village of Georgetown, I had “Spiced” or Mulled Wine for the first time. I can’t think of any recipe that says “Holiday” more than warm spiced wine on a wintery day. 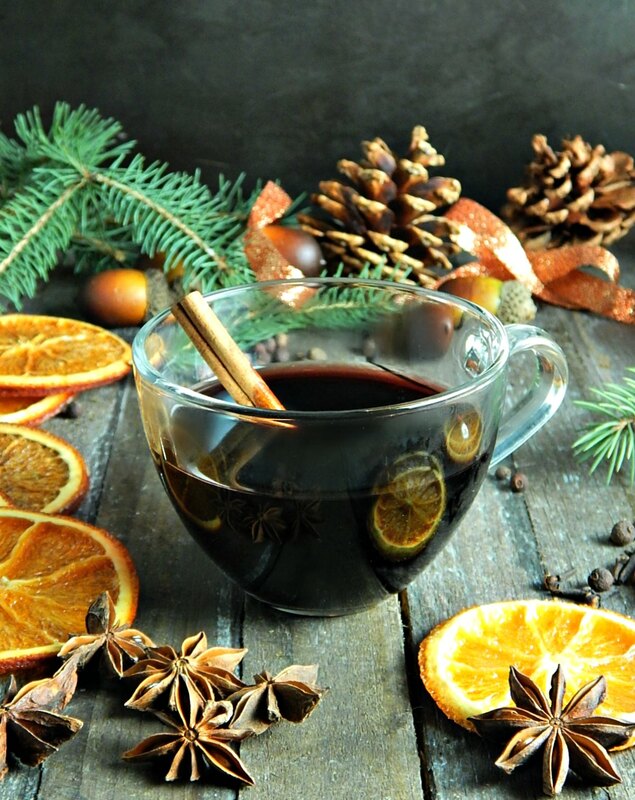 It doesn’t matter if it’s a holiday with family and/or friends in the cabin or on a ski or snowmobile trip, or a home-based gathering like Thanksgiving or Christmas, Spiced Mulled Wine makes the party! It’s said that the Romans brought viticulture along with Spiced Mulled Wine with them as they conquered area after area, up the Danube and the Rhine and to the borders of wild Scotland. They left behind what has become so much more than a beverage, what’s become a tradition in so many countries. And while it was fun to read this Wikipedia article about Mulled Wine and how it’s served in so many countries, along with the ancient recipes they’ve quoted, this is my Spiced Mulled Wine, perfect for a party or get together wherever you are. When you’re talking about “mulling” or to “mull” anything, you’re really talking about mixing your item, whether it’s a punch, tea, a cider, ale, beer or wine with a mixture of spices. You might want to check out my Spiced Tea, which is a great hot or cold, and is a mixture of tea and juices or maybe my recipe for Mulled Apple Cider for a non-alcoholic treat. On one of the Wikipedia recipes, the one from the year 1390, the spices listed are cinnamon, ginger, galangal, cloves, long pepper, nutmeg, marjoram, cardamom and grains of paradise. It’s also cautioned elsewhere that what is pleasing to one might not be pleasing to another. I can’t say that any recipe for Spiced Mulled Wine is set in stone, even mine, which I’ve tweaked and changed over decades. I think you’ll find mine is “pleasing.” Feel free to tweak it to suit your tastes; there’s no right or wrong. Some people add nutmeg, black pepper or cardamom to their spice mix. Others like to play with the amounts or types of sugar, brown sugar, raw sugar, honey and so on. Then there’s the citrus which can be orange and/or lemon. Still, others like adding different types of booze or spirits which can up the alcohol content, or add a touch of water, bringing the alcohol and the intensity down. Or both! The best advice I can give you is to make more! The recipe below is for one bottle, which will serve about 4 people a small cup, but you’ll want to multiply out to serve a crowd. If you have any leftover, give it a quick strain before refrigerating so the spicing doesn’t get stronger and stronger over time. I love the orange in my Spiced Mulled Wine, and sometimes I dry the orange for the Spiced Mulled Wine and sometimes I and make up packets of Mulling Spices using the dried orange to have on hand or give as gifts. They last for an incredibly long time. I’ll post up my fave all-purpose Mulling Spices and the Dried Oranges recipes after the Thanksgiving holidays. They’ll make fun little homemade gifts, especially if you add (duh, lol!) a bottle of wine. As far as the wine, don’t use the cheapest old wine you can find for your mulled wine and you’ll probably feel better the next day – and don’t choose a pricy, precious wine, either, and you’ll feel better the next day, too! Look for something young, full-bodied and even a bit sweet that’s going to have a wide appeal, be absolutely quaffable and doesn’t break the bank. Merlot, Shiraz, Syrah, or maybe a nice blend. You’ll probably want to stick to the $8.00 to $10.00 range at the top; shoot for less! A sommelier from Eater, Jaren Weinstock has a few other suggestions. History tells us that Spiced Mulled Wine was used to make the dregs of wine at the bottom of the caskets taste better and Victorians use the Mulling Spices to cover the taste of cheap and or problematic wine (it was hard to get good wine if it came from the hold of a sailing ship!). So just use a wine you like and enjoy and you’ll probably enjoy the Spiced Mulled Wine more than the Romans or the Victorians did theirs! I love to buy spices I don’t use often (and even some I do) in their whole form. They’ll keep, literally for years in a dark cupboard or cabinet, away from heat. That means don’t keep them above your stove or in the cupboards over your refrigerator, both which give off heat. You can buy whole spices in bulk in packets at the store or market, check at ethnic grocery stores for great prices, or buy in some stores in just the amount you need. If you do that, watch at the checkout – I’ve twice seen checkers (both at different stores) put a finger on the scale to get enough weight! If you’re a wine drinker, find a shop you like and choose that shop, hopefully at least partially on the staff. A great knowledgeable person, sommelier or not, can direct you not only to the expensive wines but ones that you might not have known about or might not consider that are reasonably priced. Sign up for their email alerts and buy during the big sales, which are usually in the spring. Orange or dried orange slices and/or cinnamon sticks for garnish. Spices may be gathered in cheesecloth for easy removal if desired. Place all ingredients except for brandy and garnishes in a saucepan. Heat to just below a simmer, stirring now and then to dissolve sugar, for about 30 minutes or longer to blend spices. May be strained; if spices are left in the flavor will continue to concentrate. The mixture may be added to a slow cooker to keep warm. Add brandy to taste or pass shots to be added as desired. Note: Never boil your wine and don’t heat over 173 degrees, if possible. That means don’t boil it and don’t keep it at a simmer. I’ll be sharing my Spiced Mulled Wine at Fiesta Friday #250, cohosted this week by Jenny @ Apply To Face Blog., Jess @ Cooking Is My Sport, Jhuls @ The Not So Creative Cook and Judi @ cookingwithauntjuju.com. Thanks, guys for hosting for us for so many Fiesta Fridays! #250 is a landmark for sure! This entry was posted in Click here for Fabulous Food Posts and tagged Alcohol, Beverages, mulling spices, Wine. Bookmark the permalink. Mollie, I’m so glad you posted this, as mulled wine is all about the holidays. Here in Scandinavia we have glögg, which is our version of mulled wine. The glögg season begins the First of Advent and continues through Epiphany, which is January 6th this season. But, you’ll see more about this in my December Holiday post. I was looking at all the different mulled wine traditions around the world and thought to myself – the tradition in the US is to put it in a crockpot, go figure, lol!! I’m looking forward to seeing your post, Ron!